Widget is a content element which can be dragged and dropped into webpage blocks. To create a widget, you need to add Widget subdirectory to your plugin. There you have to create separate subdirectories for every widget. Widget subdirectory names should have no spaces or extended characters: it is recommended to use UpperCamelCase capitalization, e.g. MyWidget . You can download the most basic "Hello world" widget example here. It contains just a single view file with some HTML code. To create a widget from scratch, you need to make a new plugin. Then add a subdirectory for your widget (e.g. /MySamplePlugin/Widget/HelloWorld/). Add skin subdirectory, and create a file default.php containing HTML code to display. This is enough for widget to be used. Make sure you haven't forgotten to activate your plugin in admin panel. There are no strict rules how to implement your widget's management. 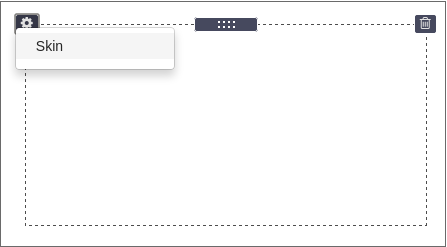 You can make editing inline as default text widget or open a popup like HTML widget. It is also up to you to place "save" buttons or autosave the content. ImpressPages will store data to the database whenever you execute $widgetObject.save(data, true, [callback]) method where $widgetObject is the first argument of init method. The first parameter of save method accepts the data to be stored to the database, next parameter instructs system if the widget has to be reloaded. Additionally you can pass a third parameter - a callback function. Widget's function should start with IpWidget_ keyword. The data you save is automatically available in skin/default.php view file described above. Use that data to generate widget's look. All the public files used in a widget, such as images, should be placed in assets subdirectory of the widget. In some cases you might need to controll widget's behaviour in PHP side. By default all widgets use \Ip\WidgetController class. You can extend this class and reimplement default functions in the way you need. To do so, create Controller.php file in your widget's root directory with following content. This simple example sets a widget title. Please have a look at Ip/WidgetController.php file for other functions that you can override. A widget can have several different HTML skins, which basically are widget's view files placed in skin directory. This is a good way to provide several different looks of the same widget. The default skin file has a name default.php - this skin is mandatory for all widgets. But you can add any number of additional skin files. For sample code, see Divider widget, located in ImpressPages Ip/Internal/Content/Widget/Divider directory. If widget has more than one skin, a gear icon will appear on the left corner with option to select the skin. In PHP controller you can modify data before it is passed to the skin. Extend generateHtml method to do so. To change a default widget icon, place a file called icon.svg or icon.png to your widget assets directory. Widgets often need an additional HTML in management mode. Add subdirectory 'snippet' to your widget. Any view file placed in here will be automatically added to the end of HTML body. So you can use it straight away in widget's management JS.